If you have been considering the possibility of building a structure such as a building, agricultural space, aircraft hangar, arena or other similar types of buildings, you must be aware of the various methods and materials available to construct them. Construction as an industry has evolved and saving time as well as money are a key driver to the increased use of prefabricated steel-frame construction. Pre-engineered metal buildings have gained popularity and building these metal building construction kits comprised of parts numbered to designs and manufactured on a project-by-project basis is obvious in commercial, retail and other building designs. The thing that makes pre-engineered metal buildings so valuable is that it’s modular. This means that it can be reconfigured, broken apart and reassembled back to a number of different variations as per need. Below are five things that confirm the popularity and increased use in the future of prefabricated metal buildings. 1) Reduced construction & initial costs: Pre-engineered buildings are more economical and practical which is why they are gaining popularity. Not only is it less costly and much easier to implement but once it’s complete it requires less maintenance than a conventional building. Prefabricated metal buildings are far superior to regular building structures at resisting damage from fire and extreme weather conditions. These buildings are mould resistant so they hardly ever see pest infestation. As a result, these buildings are cheaper when it comes to insurance. In the pre-engineered metal buildings industry, forty-year old building warranties are a norm. Panel Built being the leading modular office provider offers some of the best available metal building offices that are less costly and can be customized to unique office requirements. 2) Quick & Easy to Design: Prefabricated metal buildings have a predetermined and streamlined process to build and neither an architect nor an engineer is required for the process. It is obvious these designs require fewer resources hence the less cost. They’re easy to customize since they do not have any framing limitations that are inherent in wood and these buildings accommodate over 200 feet of clear span, hence making them the desired choice for large open facilities like airplane hangars, sports facilities, media centres etc. These are the new era of metal buildings and they are not just large blocks of metal plus companies can go for stylish metal building designs with any traditional exterior. This is a type of flexibility that allows businesses to adjust in every situation and if office space can be modified as per requirement it leads to increased efficiency. Modular office buildings are the key to a flexible and productive office. 3) Time-Saving Metal Building Kits: A key benefit of pre-engineered metal buildings is that these buildings can be completed with great speed and ease. A complete and customized metal building kit is delivered to the customer within a few weeks which is contrary to conventional building structures that take months or sometimes years. These buildings are strong and you can do things with steel that you can’t with wood and possibly even concrete. Steel is lightweight which means designers and architects can benefit from the openness of the structure which is not possible with wood or concrete. 4) Durable & Long Lasting: The construction material used in these metal buildings is of high quality and they are more durable, long-lasting, and inorganic requiring rarely any maintenance. The buildings are easy to repair and reconfigure since they allow for easy expansion and other structural changes. Walls can be added or removed as per requirement of the customer and without affecting the actual structure of the building which is unlike anything in conventional building structures. Similarly, adding windows or doors are easier. Since steel is recyclable, it makes these prefabricated metal buildings an environmental-friendly choice. Steel is stronger than wood and it never splits, cracks or splinters which makes it far more resistant and durable to termites, rodents, water infiltration, rot and mould that can easily affect wood. 5) Easy on the Environment & Energy efficient: Pre-engineered metal buildings are energy efficient and easy on the environment. Metal roofing and siding reflect sunlight as well as heat which in turn keep the interior cooler during summers and warmer during winters. Hence, less air-conditioning or heating is required during extreme weathers and it saves energy and expenses. Insulated metal panels and energy saver material that is used in roofing make these metal buildings more efficient. Where to buy pre-engineered metal buildings? Panel Built a leading modular design solutions provider offers the best available metal building offices. 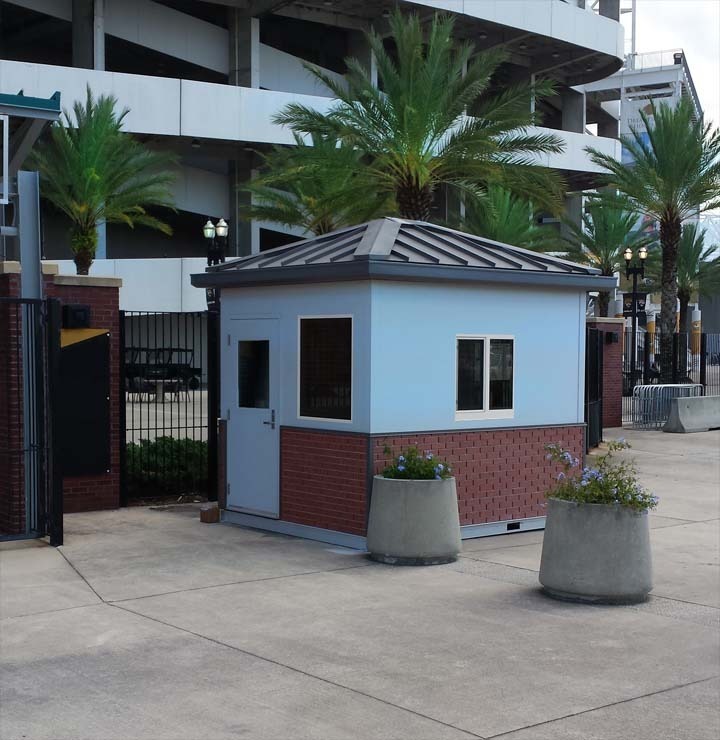 Some of the most cheap metal buildings available with ample customizations can be found at Panel Built. We offer the best prefab metal building prices online which are an added benefit since Panel Built allows you to order customized prefabricated metal buildings online through the website. Panel Built Inc. is a world class manufacturer of prefabricated buildings, offices and mezzanines. Our belief is total customer satisfaction. We pride ourselves on listening to our client’s space needs and providing creative solutions within their budgets. Our customers, dealers, and employee relationships are the building blocks of our company. We strive to provide a positive work environment which is safe and rewarding to enrich the lives of our employees and their families. We offer, steel mezzanines, custom modular and pre-assembled offices exterior buildings. All our numerous product lines are manufactured on site, in two state of the art production facilities.